A new Kenworth chassis and pump, approved by the City Council, and purchased during 1951, has been delivered to the city and is at present in the City’s Shop, where work is being completed, under the supervision of Mr. Findle, Works Superintendent of the City. This work entails building a body and installing the necessary equipment to make this chassis a complete piece of apparatus. The specifications and design for two new pumpers were heavily influenced by a Seattle Fire Department Kenworth. However, there were some features that reflected Victoria Fire Department preferences such as two booster reels rather than one. The Seattle Kenworth was also fitted with compartments, left off the VFD rigs, which meant that its Canadian ‘cousins’ differed somewhat in appearance. The first pumper was completed, then tested and approved, by the B.C. Fire Underwriters. Upon approval, it entered VFD service at the James Bay Fire Hall in June 1952. 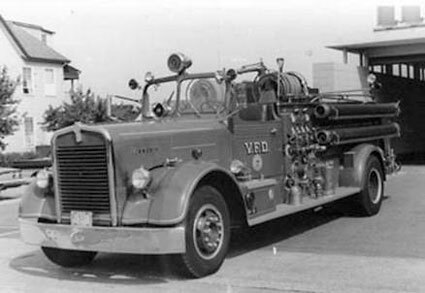 The second VFD Kenworth pumper, which was identical to the first, was approved by the 1952 Council and entered service a year later replacing an older piece of apparatus at the Burnside Hall. The third, and larger, Kenworth acquired was fitted with an elegantly streamlined city service ladder body. It joined the VFD roster on 22 June 1954. All three Kenworths served Victoria into the 1970s. The only VFD Kenworth to survive to the present passed through several hands after its retirement, including the British Columbia Provincial Museum Transport Collection and Inland Kenworth, which undertook a limited restoration. When the Transport Collection was dissolved, it, like the 1935 Studebaker Combination, was returned to the city and the Fire Department it had served for so many years. 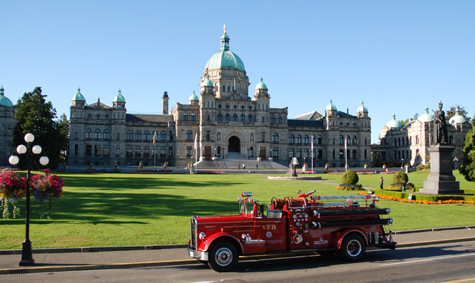 The Victoria Fire Department Historical Society has been progressively restoring the 1952 Kenworth. It has been, and continues to be, a very heavily used part of the VFDHS Collection and considerable work is needed to keep it operational. The original Hale pump was removed some years ago but an equivalent pump of 1050 igpm capacity, by the same manufacturer, is being installed in early 2006.